Monsier Merde (Denis Lavant). Courtesy of Mongrel Media. That is just one of many questions that can go through one’s head as you attempt to follow this film. And just one of the many unanswered questions that becomes increasingly frustrating the further you get through this film. 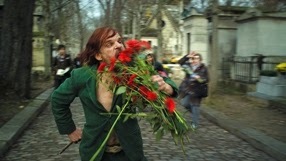 “Holy Motors” has been described as a day in the life of a con-man. Too bad he’s not a con-man. The second and third segments, involving Oscar in a luminescent, body movement/sexual performance and then infiltrating a model’s photo-shoot as a crazy man, make it clear that Oscar is in fact a street performer/actor (and hit-man, but acting as a hit-man is the more likely conclusion). But apparently only those who like and “get” this film will see how he’s an actor. That’s the type of pretentiousness this film inspires. Kylie Minogue. Courtesy of Mongrel Media. Each segment is unrelated, connected only by Oscar transforming himself for his next job in the back of his limousine. This makes the majority of the film completely pointless. Since viewers are not morons, and we have understood that he's an actor and preparing for his next job, all the film tells us over and over again is that he's an actor preparing for his next job. Repetitive and unnecessary scenes make it boring no matter how interesting the visuals are. Strong colour choices and inventive light placing and intriguing shot framing try to trick the viewer into thinking there's more to this film than there actually is. At one point, we are supposed to care for Oscar (who knows when that connection was supposed to occur) because one segment features Oscar with a similar street performer/actor, presumably a former love interest. In this segment they sing a song called “Who Were We When We Were Who We Were?” I think that type of verbose nonsense speaks for itself. The make-up work actually was quite phenomenal. Visually, Oscar was truly a different person in each segment. Story-wise, Oscar was a different person in each segment, which makes the film extremely non-cohesive. At the end, the film pretends that they presented ideas about the future of society, the isolated nature of individuals, and the life of an actor, but there wasn’t a single coherent idea in that film. It was all very meaningless.